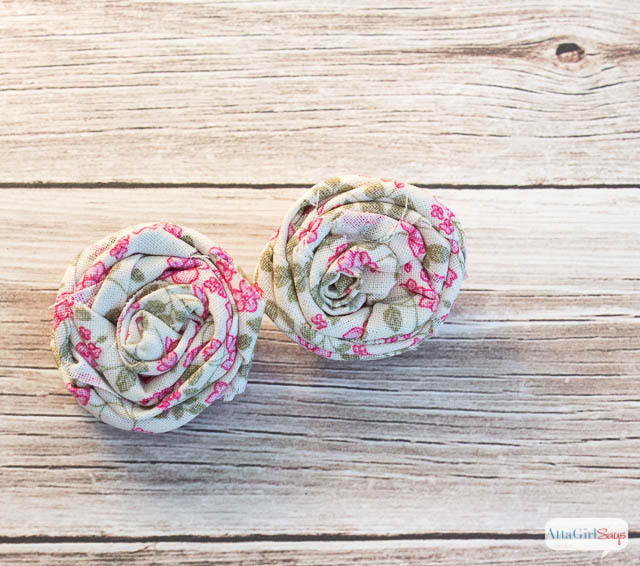 For this month’s No-Sew showcase, I’m revisiting one of my favorite craft techniques: rolled flowers made from strips of scrap fabric. 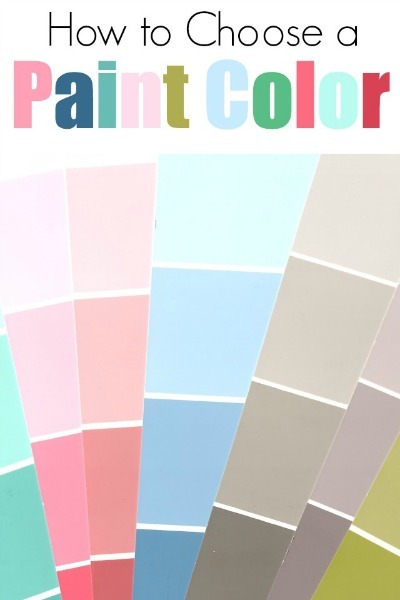 We’re celebrating spring this month with projects to help you fluff your home and your wardrobe. 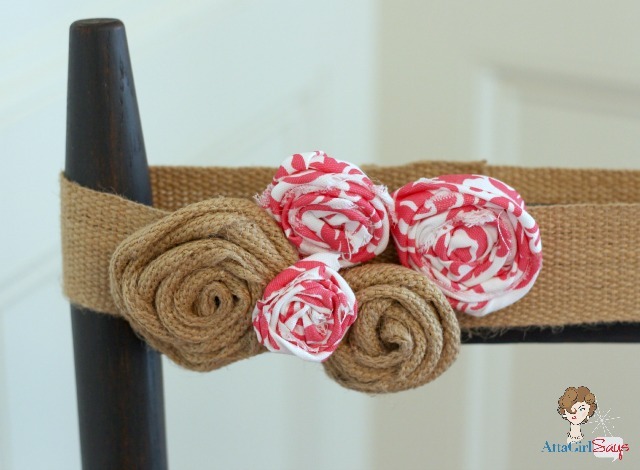 You may remember that I used some rolled fabric flowers for my no-sew chair makeover a few months ago. I’m telling you, this is one of those crafting skill that you can haul out any the time when you want to look smart and creative but when you don’t have a lot of time or money to spend. 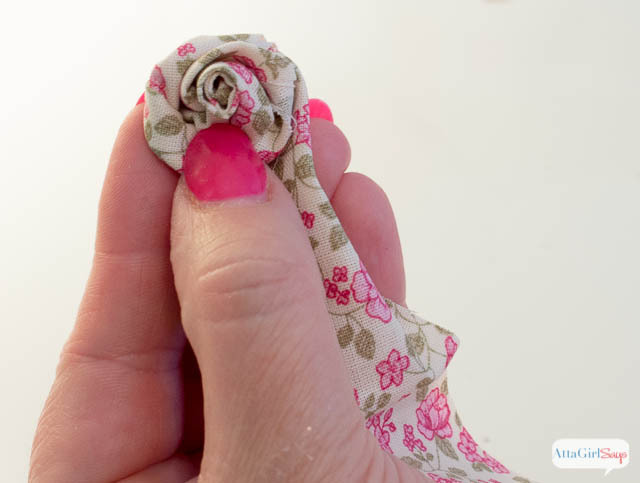 All you need is a strip of scrap fabric and some glue and you can make rolled flowers that you can use to decorate all kinds of surfaces: flip flops, tea towels, furniture, wreaths, scrapbooks, lampshades, napkins, handbags, scarves, napkin rings. You name it. Start out with a strip of scrap fabric. The length and width don’t really matter. 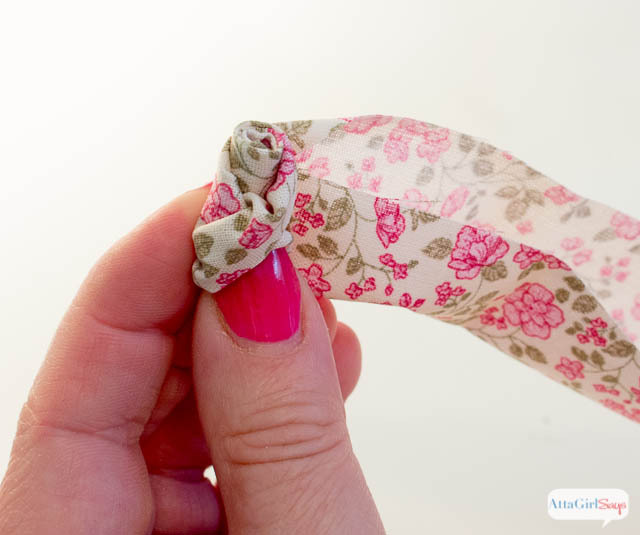 Fold the strip in half and secure with a dab of fabric glue. 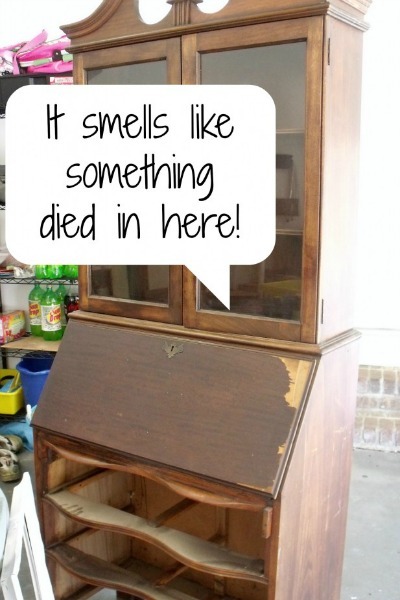 (I like to use Aleene’s Fast Grab tacky glue. 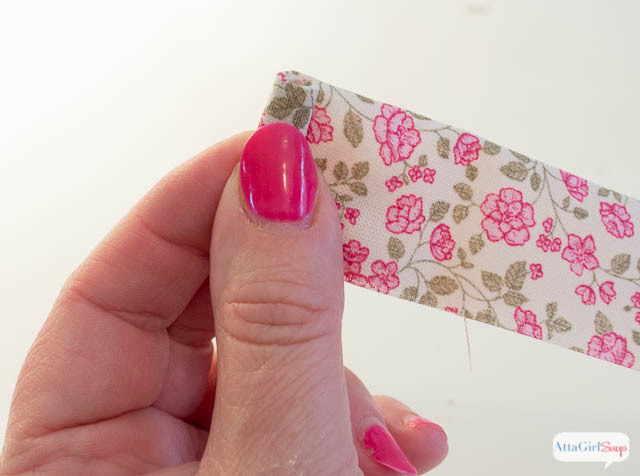 Apply a thin line of glue to the right side of your strip and roll to create the center of your fabric. Once the center is formed, continue rolling, twisting the fabric as you do. Continue rolling tightly. Apply a dab of glue periodically to secure your flower. 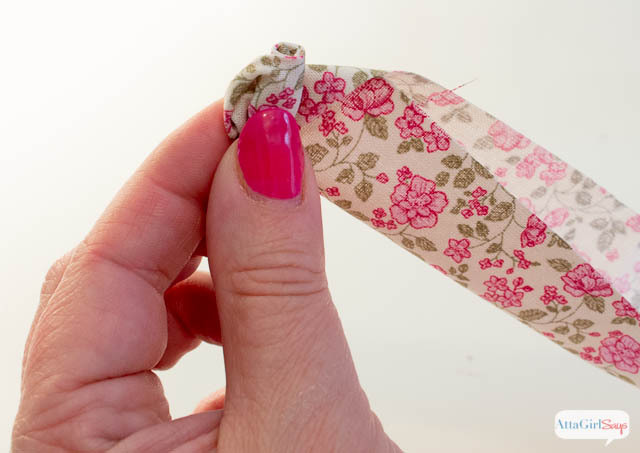 Continue rolling until you the flower is your desired size, making sure to leave a tail about 1-inch long. Apply glue to the bottom of the flower and cover with the tail. 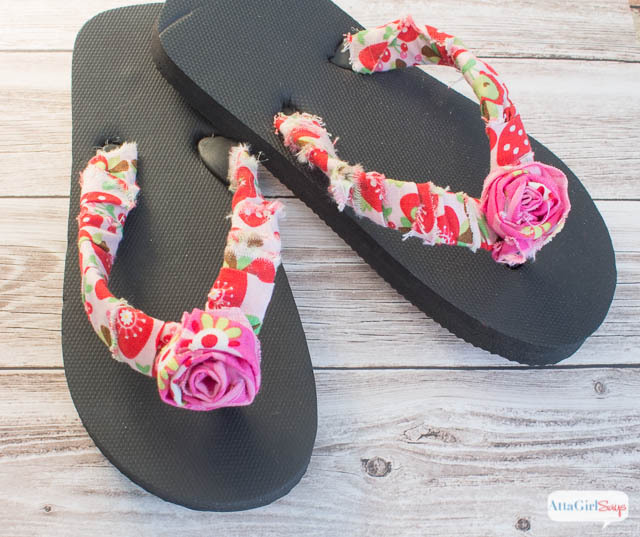 To make these embellished flower flip flops, I just wrapped cheap dollar store flip flops with scrap fabric, securing with fabric glue. 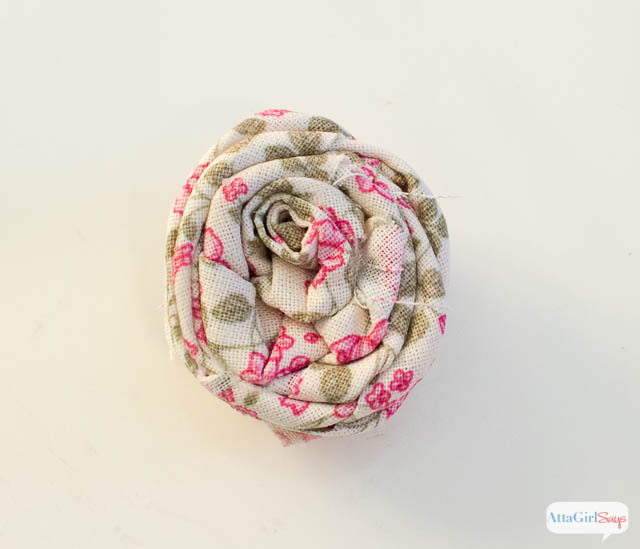 Then, I hot glued a fabric rose to each one. Boring to fab for free! And it took me hardly any time at all. 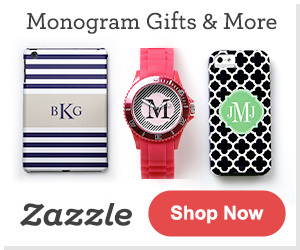 You could make a pair to go with every outfit! 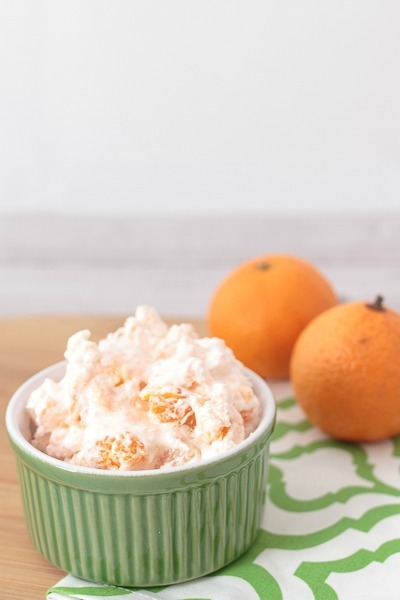 Be sure to check out the projects from the other no-sew Showcase participants, including this month’s special guest, Jessica from Mom 4 Real. I love our gang, too. And I think my flip flops and your wreath should hang out. So adorable, Amy! I bet the are much more comfortable too! LOVE this sassy new way to wear flip flops. What a fun group of girls!!! I think you need a pair of flip flops to match your fabulous market tote. I am in love with your project and that fabric. 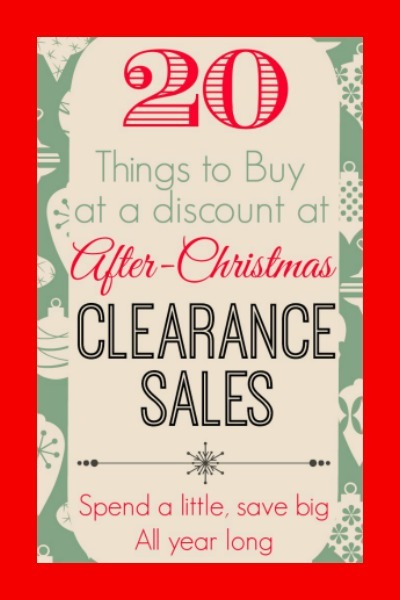 It definitely makes me want to go shopping — a very bad thing. I love our monthly no-sew challenges. It’s always fun to see what everyone will come up with. Look at that sweet tutorial and perfect nails! Love it! I love making rolled flowers. 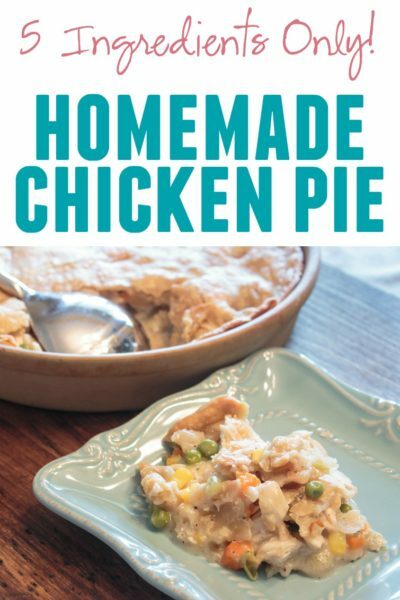 Once you get the hang of it, they are super easy to make! 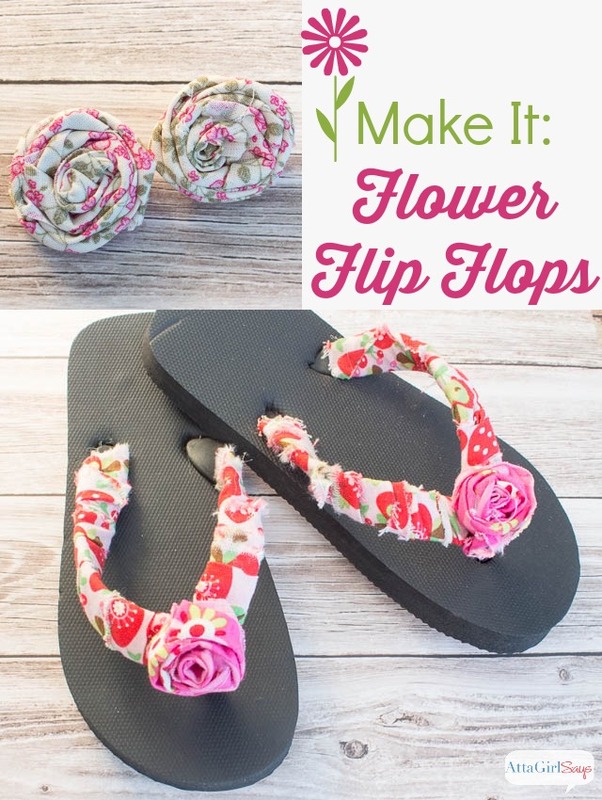 What a cute idea for embellishing flip flops!